Neel Jani placed the black no. 18 Porsche 919 Hybrid at the top of the time sheets during first qualifying at the 24 Hours of Le Mans last night as Weissach’s trio of LMP1 racers locked out positions one to three in the two-hour session. The Swiss driver set a scintillating lap of 3m16.887s early in the session. His time, aboard the car he will share with Marc Lieb and Romain Dumas, was the fastest lap seen at the Circuit de la Sarthe since the introduction of the two chicanes on the Mulsanne straight in 1990. Behind, Timo Bernhard in the red no. 17 Porsche 919 also set his fastest lap towards the start of the session, stopping the clock with a time of 3m17.767s, good enough for a provisional second place on the grid. The no. 18 Porsche 919 Hybrid sits second provisionally after Timo Bernhard’s lap. The third Porsche 919 Hybrid, the white no. 19 machine, initially found itself behind the fastest of the Audi R18s until Nick Tandy stepped behind the wheel late in the session to set a time of 3m19.297s, nearly 2.5 seconds away from pole but still good enough for third. The British ace (and Total 911 columnist) remains optimistic that he can go faster in Thursday’s two qualifying sessions should the conditions remain dry. Nick Tandy was the fastest of the three drivers in the no. 19 Porsche 919 Hybrid. In the end, the fastest of Ingolstadt’s challengers could only just get within 3.0 seconds of the quickest Porsche with the no. 8 Audi R18 of Lucas di Grassi, Oliver Jarvis and Loïc Duval settling into a provisional fourth place thanks to the latter. Marco Bonanomi put the no. 9 Audi into fifth, while Benoît Tréluyer left it until the final 30 minutes to set the championship-leading no. 7 Audi’s fastest lap: a 3m21.839s. Toyota’s difficult 24 Hours of Le Mans continued as the no. 2 and no. 1 TS040 Hybrids could only secure provisional grid slots of seventh and eighth respectively as both cars lapped over 6.5 seconds slower than the no. 18 Porsche 919 Hybrid. Porsche’s fortunes were not so strong in the GTE Pro class. Weissach fared less well in the LMGTE Pro class where the two Porsche Team Manthey 911 RSRs could only manage sixth and eighth, the no. 91 entry ahead of the no. 92 car. In LMGTE Am, Klaus Bachler put the no. 88 Abu Dhabi-Proton Racing Porsche 911 RSR into a provisional fourth ahead of Patrick Long in the no. 77 Dempsey-Proton sister car. Qualifying concludes this evening with two two-hour sessions, the first of which kicks off at 7pm local time. The third and final qualifying session starts at 10pm, with the grid for the 83rd 24 Hours of Le Mans locked in at midnight. For all the latest news from this year’s 24 Hours of Le Mans, make sure to check out our dedicated motorsport section. The no. 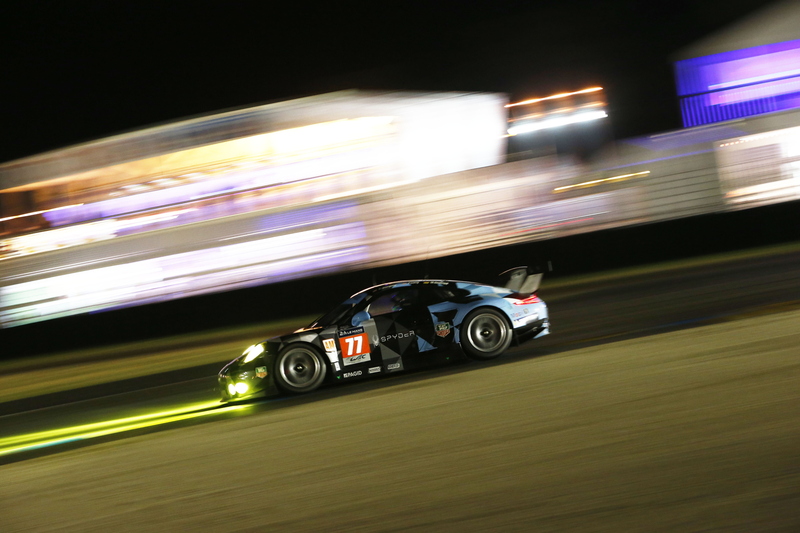 77 Porsche 911 RSR of Patrick Long, Patrick Dempsey and Marco Seefried currently sits fifth in GTE Am.